So that super exciting day of getting together with the family, eating too much, watching shows, playing games, etc is here! With the current political climate, some of you may fear someone at the table starts on that crazy bandwagon and it’s all downhill from there. Netflix confirmed that you need not worry, just talk about the shows you’re watching. 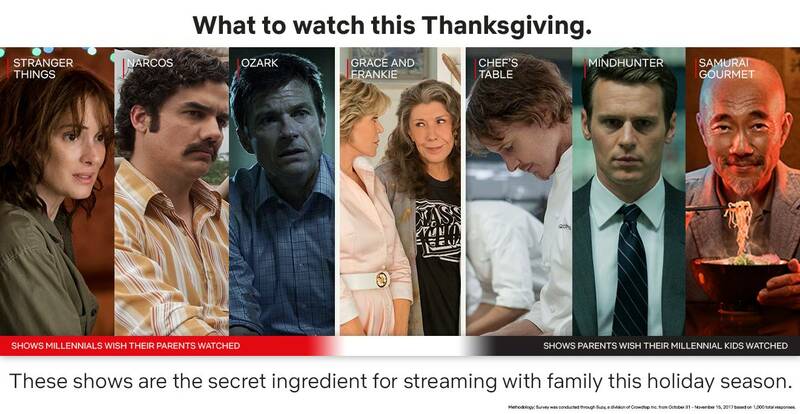 According to Netflix, about 82% of millennials believe “talking about TV shows is a fun, tension-free, and meaningful way to bond when home for the holidays.” What better shows are there to talk about than the ones they’re binge-watching, like #GeorgiaFilm Stranger Things and Ozark. The 80s are alive and well in Stranger Things and oh the stories your family will have about that time and the hair! Just wait! Go back to the beginning and binge season 1 to start or if you want something quicker check out Gaten Matarazzo’s less than 7-minute recap or check out Millie Bobby Brown rapping out a recap. Hawkins, Indiana is actually a combination of locations around the Metro Atlanta area and beyond, like the cute town square in Jackson a smidge South of Atlanta and Hopper’s cabin and the pumpkin patch in Powder Springs a smidge West. Once you’re all caught up and know what we’re talking about you can go, Feed Dart! Dave Chappelle is even getting in on the fun w/ his latest special that’s set to drop New Year’s Eve, Dave Chappelle: Equanimity. Instead of a Demogorgon Eleven will now have to go up against Chappelle…place your bets! For laughs after all the Demogorgon and Upside-Down madness check out the Gaten Matarazzo/Joe Keery Google answering bit here. These kids are a hoot! Great news too! ST has already been picked up for a 3rd season so watch out for those casting notices if you’re going to be in Georgia! Jason Bateman is no stranger to GA filming from The Change-Up to Identity Thief to Office Christmas Party, he’s practically a local so we have to assume when looking for locations for Ozark, Georgia was already on his mind. Lake Allatoona in Georgia plays the Lake of the Ozarks in Missouri and other than the shot of the family standing on the cliff up in Missouri everything was filmed here in the (expanded) Metro Atlanta area. This is a deep show that brings up memories of Breaking Bad and we are super-thrilled to have it back for another season! While season 1 didn’t film here, Mindhunter is another great Netflix series and it’s coming back for a 2nd season. While it hasn’t been confirmed if the 2nd season will film here in Georgia, the newest season will focus on the Atlanta Child Murders from 1979-1981, a fascinating story that resulted in the arrest of Wayne Williams, so check it out and get ready for the second season by binge-watching the first during Turkey Day! Get In. Geek Out. Feast On.